Join us for a bikeride through the Montana Historic District with Margaret Smith, grandniece of Henry Trost, and VeloPaso! We will start bright and early at Salt + Honey Bakery and Cafe on Sunday, November 12 at 8:30 AM for breakfast and conversation, then hop on our bikes to let Margaret lead us on a tour of the Trost Mansions on Montana Avenue – seven in all! This tour is open to everyone, $35 per ticket which includes breakfast and the two hour tour. Don’t have a bicycle? 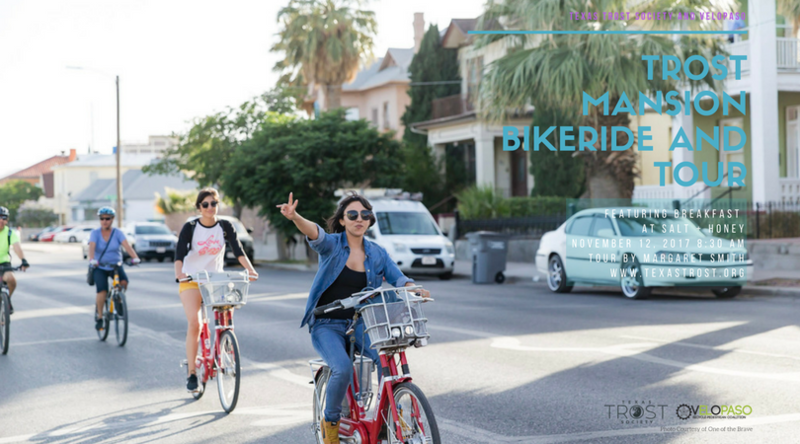 We will be meeting people at 7:45 AM at the Bike Station in front of the History Museum to rent out bikes, then taking a ride all together to Salt + Honey (make sure to buy the “Tour + Bike Rental” option). Can’t ride a bike? Email us at malissa@trostsociety.org so we can arrange a pedicab for you (additional fees will apply). Don’t miss your chance to be the first to take the Trost & Trost Historic Mansion tour! Reserve your spot today! Our Mission is to promote the legacy of Henry C. Trost, one of the most iconic architects of the American Southwest, and educate the public about the architectural patrimony of our region.